3-Driver audiophile configuration: Improve overall sonic spectral balance for music that sounds fuller, warmer and more faithful to the original source. Woven glass fiber cone driver: Experience rich, clear midrange audio and a broader sound stage. Cloth dome tweeter: Hear crisp, detailed highs with a dedicated tweeter. BasXPort technology for enhanced bass: Enhance the low frequency response without the bulkiness of a subwoofer. Convenient access: Get the bass, treble and volume you want with the easily maneuvered controls. Hear it on the big screen: Connect the speaker system to your TV or gaming console and enjoy solid audio entertainment. Great 2.0 speakers. Good bass too. You'd think it isn't possible yet here they are. Great if you don't want to use a lot of space for good sound. 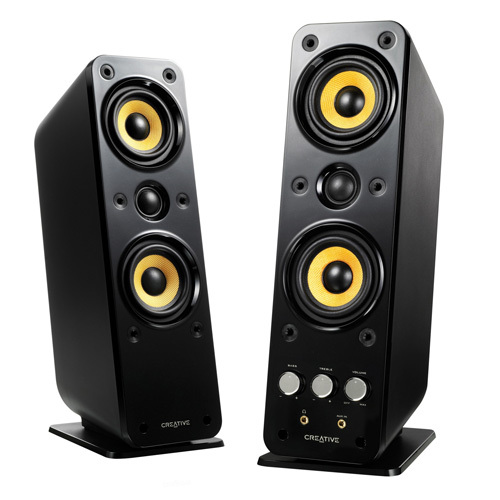 I fell in love with these the minute i tried them, best speakers I have ever used.